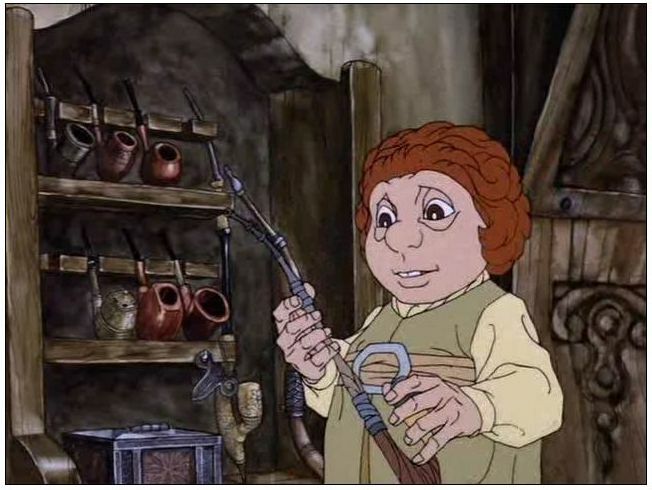 Smoking is a popular pastime among hill dwarves (halflings) and quite a few real-world friends both on and offline. But what goes into their pipes? Especially in a magical universe where almost anything is possible, and the unexpected is both expected and very, very real. That's the question we tackle this week, as we offer several gourmet uh, herbs, to put in YOUR pipes! Unfortunately, stealth is impossible in this altered state, as the smoker says "far out" and "wow, man" repeatedly! Unfortunately, speed and/or strength suffers proportionally, with combat movement reduced to 10' per round and strength or balance attempted at -3 while the smoker ponders the universe and just wants to chill! It also makes them a beacon for ethereal creatures, who have a 1 in 1d6 chance of targeting unsuspecting users. Fortunately, the user also enjoys +3 to all saving dice, since the gods, apparently, look after fools and drunks! WOODSTOCK: A less common form of Greenjeans, this "tobacco" is virtually indistinguishable except to frequent users. 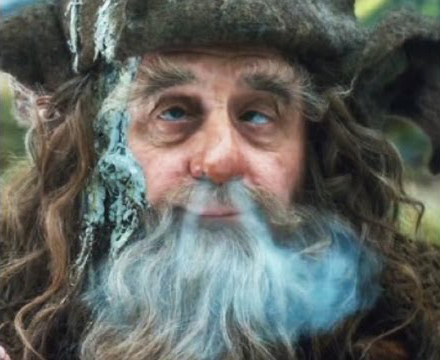 If smoked in close quarters (no more than 20' x 20'), it has the above-listed effects on EVERYONE through a powerful contact high extending to all within its range, including enemies, who become pacified for the duration. Optionally, the referee can require saving dice to avoid the room breaking out in anti-establishment protest songs! Obviously, these are meant to be used on adventures, although with the above side effects. Smoke at your own risk. Right off the bat, we see some awesome Dave Trampier artwork, complete with the old-school flourishes that made Wormy such a great read. But more importantly, we're treated to a classic party of adventurers, complete with henchmen, not during the battle, but in the AFTERMATH of the fight. People are disposing of bodies and some are busy prying a massive gem from an idol! I mean, these guys are literally checking their maps, piling up slaughtered corpses, and cleaning weapons. Sure, victorious enemies probably do all of this. But no one sees it! I'd go as far as to say that treasure is virtually an EXCLUSIVE preoccupation for the players and something that couldn't be taken for anything else. Now we've had many editions since then, all adequate in their own right. 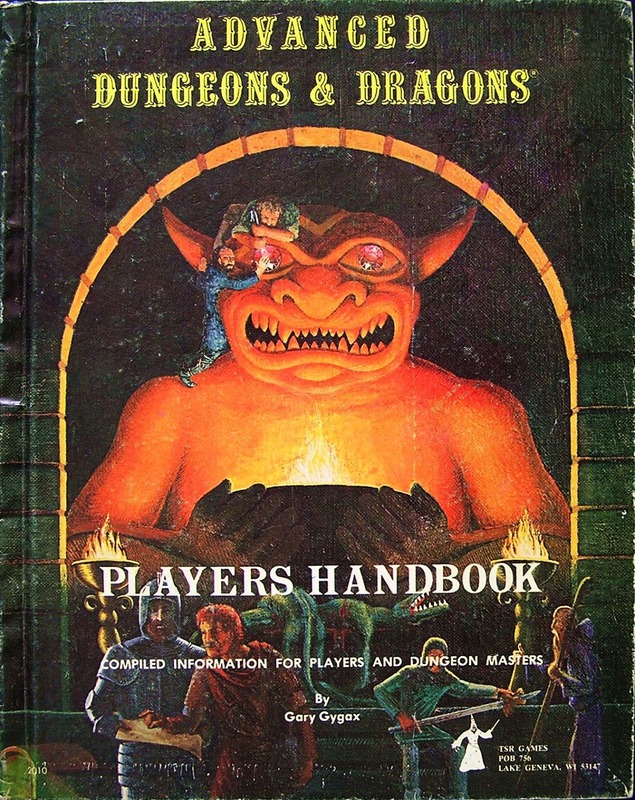 But none of them proclaim "THIS IS A BOOK ABOUT THE PLAYER CHARACTER" like the original! Take the second edition cover. Here's a warrior charging into battle on horseback. It's plenty adventurous, and actually pretty awesome. But is it a player character or an NPC villain? 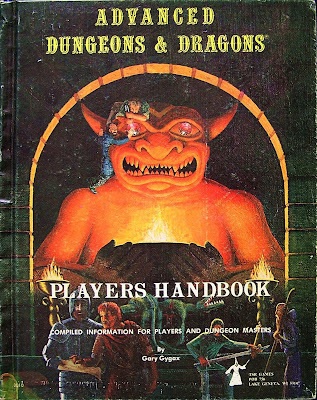 Guide or even the Monster Manual! 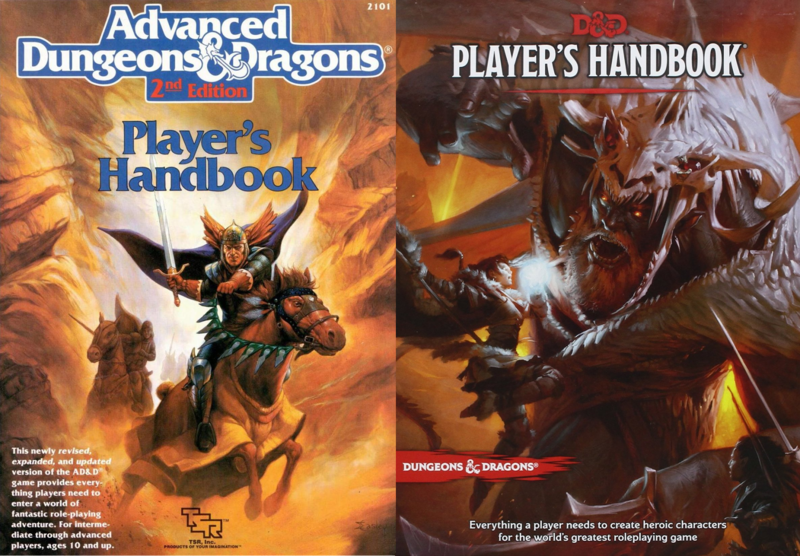 The fact is, these covers could just as easily be the Dungeon Master's Guide or even the Monster Manual (especially in the case of the fifth edition book). There's nothing here that speaks to the EXCLUSIVE interests of the player character. And no, not even pictures of pitched battles are EXCLUSIVELY in the player's realm, because monsters are MONSTERS and have their own manual! And the dungeon master? Honestly, the DM oversees pretty much EVERYTHING, including combat. And while the player characters are surely involved in battle, it's hardly exclusive. But employing henchmen, managing resources, and cataloging treasure falls SQUARELY into the player's domain. It's TRUTH in advertising. So, as a bit of introduction, Talon is an enthusiast of simple, narrative-driven games and has some impeccable credentials in this area with his excellent OneDice Supers game. So when he said he planned on publishing something under our Open Supplement Licenses, we were understandably thrilled at the prospect! And speaking of classes, you can now be a NECROMANCER. Fun! Needless to say, the whole thing reads like the best referee's campaign-specific notebook. A playable Grave Touched race and the Shadow Guards (an alternate cleric) map a macabre new direction, perfect for Halloween or any other occasion. You really get a sense of a unique setting implied by these new additions. But you also get some new materials for Blood of Pangea and Retrospace under our new OSL. Among other things, Talon offers an optional critical system for those who fall to zero MIGHT in the heat of battle. This is simple and easily integrated into whatever your campaign is already doing here. Oh, and one standout is the Bloodless, an elven race for Blood of Pangea. You see, Talon knows that Robyn likes elves and understood her disappointment at their absence in sword and sorcery, offering up something in the best spirit of both. She says thanks! 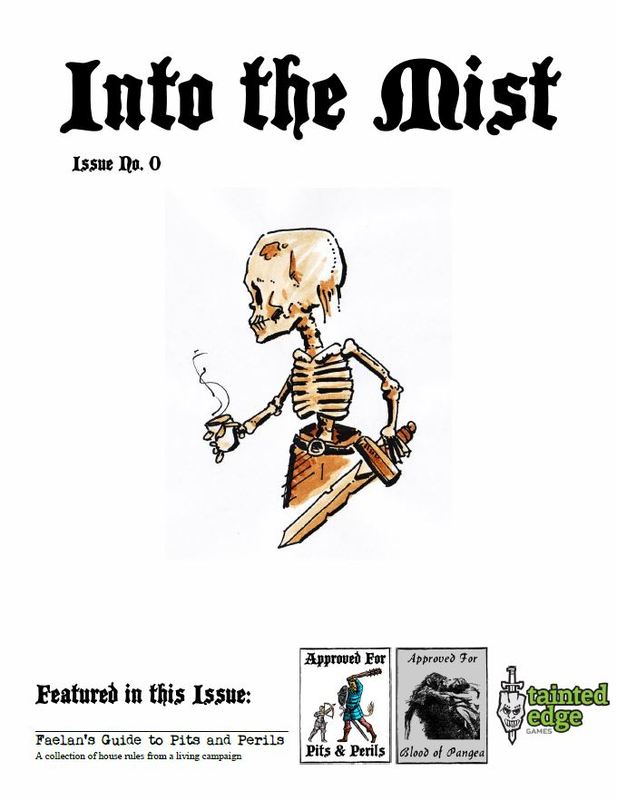 Into the Mist is available as a ready-to-print PDF, so check it out!